Welcome to the island that looks like a strangled duck! Its main features include scrumptious seafood eateries, luxurious cellar doors and Tassie’s best outhouse toilet. Don’t be fooled into thinking it’s small – Bruny Island is anything but! It’s just over 50 kilometres from north to south, which is the equivalent of driving from Sydney’s Bondi Beach to Penrith. Our guide below shares the popular attractions, eateries and tippling spots, and most can be done in one day. But feel free to linger. 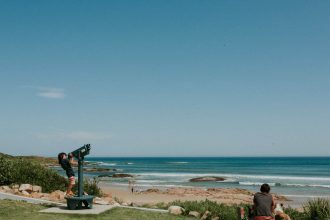 From the Cape Bruny Lighthouse in the south to the Jetty Cafe in the north, here’s our list of top attractions to visit on your next day trip to Bruny Island. Please note: Many hire-car companies in Tasmania do not allow their cars to be driven on Bruny Island. We recommend hiring a 4WD or equivalent and taking extra caution when travelling on dirt roads. You will also need a Tasmanian National Parks Pass to enter certain areas of the island. No, we won’t discuss the naughty hidden pun, but we will tell you that Get Shucked is a top spot for oyster lovers. The restaurant has been visited by celebrity chef Adam Liaw, who was happy to have natural oysters after finding the kitchen was closed, because “that’s the best way to eat them.” We recommend getting there when the kitchen is open, though, so you can get a range of natural and specially dressed oysters. While you’re there, get an alcoholic beverage to match and even learn about oyster farming. 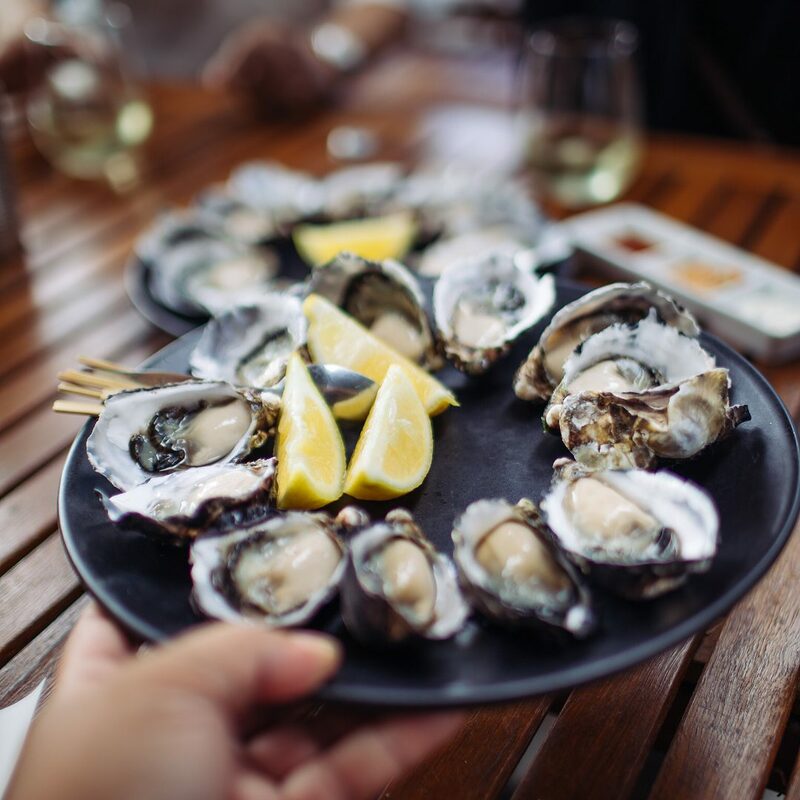 When you’re on an island surrounded by sea, it’s obligatory to harvest and sell seafood, and that market was snapped up by the Bruny Island Seafood Restaurant. Stuff yourself silly with their seafood basket, featuring all the tasty treats from the nearby ocean. Or may we suggest their crumbed Blue-Eye Trevalla with chips and slaw? They even serve fish and chips for the kids and host a well-stocked bar for tipplers. It sounds healthy, but be warned: Bruny Island Berry Farm is a sweet tooth’s utopia. So if you’re desperately watching your figure, then book yourself an afternoon of berry picking in their adjacent farm instead. There you can collect a worthy selection for the trip home or to “accidentally” gobble up before you reach the car. However, if you don’t care about eating healthy, then let your eyes wander through their mouth-watering menu. Indulge in their speciality pancakes with fresh fruit, thickened cream, an ice cream scoop and berry coulis – or head over to their ice cream bar for a berry delicious wafer cone or cup of creamy cold goodness. Nothing beats pure honey – which is why Bruny Island Honey is one of Australia’s best bee farms. With 900 hives at their disposal, the Wright family follow the bees around Tasmania to collect a wonderful selection of honey extract, with much of their stock collected on Bruny Island. Their Leatherwood honey comes from Mt Mangana and their Manuka honey comes from the Great Bay and The Neck. Our top pick is their Bush honey which comes from all over the Island, depending on where the eucalyptus grows; it’s what honey should taste like. Wine connoisseurs would be kicking themselves if they missed out on this vineyard and winery restaurant during their day trip. Bruny Island Premium Wines is a local winemaking enterprise, selling a hearty selection that changes with the seasons. Check into their Bar and Grill for some seriously tasty burgers and other ample items while letting your tastebuds travel through their wine list. You’re also welcome – and encouraged – to make a booking or appointment. It’s the first and last attraction you’ll see on Bruny Island as it’s right near the ferry terminal. Bruny Island’s House of Whisky is a one-stop shop for Tasmanian single malt whisky and gin. Highly recommended for those who don’t mind splurging a little more than what they would at their local bottle shop. But don’t fret, as the selection here is worth the pennies. The bar also includes proficient connoisseurs. Happy tippling! You can’t visit Bruny Island without stopping at The Neck. The spectacular view from the top shares a bittersweet comparison between the gushing waves from the Pacific Ocean on the left and the calm waters on the right. During the warmer months around dusk, you are likely to see the local fairy penguins hobble back to their nests and burrows. Also, keep an eye out for short-tailed shearwaters who may be nesting. Please Note: The boardwalk and the stairwell are currently undergoing maintenance with completion expected by mid-December 2018. It would be silly to call it Adventure Bay without a bit of adventure – and it does not disappoint! Along the southern end of the bay is the seafood restaurant mentioned before, along with a Captain Cook memorial and the locally famed fluted-cape walk that features a good view of Penguin Island at the end (allow two-and-a-half hours, not recommended for kids or physically challenged). At the northern end of the main beach is Matt Carney’s sculpture, depicting a whale and her calf inside a globe of the world. 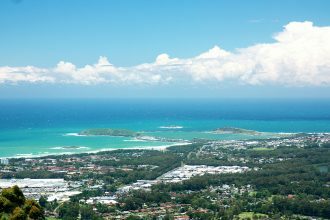 Further north is the berry farm, with Captain Cook’s landing spot on the coastline opposite – commonly known as Two Tree Point. Plenty of adventure! Cloudy Bay is home to Tasmania’s best outhouse toilet, given simply for its amazing view of Cloudy Bay Beach. Aside from this, there’s the lagoon with the inlet which you can stroll to in the north-west and there’s the East Cloudy Head walk that goes along the south. The latter takes about four hours return and some parts of the route are not properly marked. Make sure to pack supplies and take caution. Mt Mangana is the highest peak on Bruny Island featuring the most diverse range of flora and fauna. The walk from Coolangatta Road ascends to the viewing spot seen above on the left, showing the expansive southern end of Bruny Island, while taking you through a luscious and untainted forest. You may want a sturdy vehicle to tackle the road going up, though; it’s quite bumpy. If you blink, you’ll miss it. On your way to the Bruny Island lighthouse, just past Cloudy Bay, is a lookout with a tree-laden view of Mabel Bay. But, if you take the time to check it out, you can find your way down to the pristine beach below. A few steps south of the lookout is a dirt road; follow that down and you’re on you’re way to a superb reading location or picnic spot. Or even surfing spot! Tasmania contains a lot of old buildings, from Tasmania’s oldest still-running flour mill to Australia’s oldest stone bridge, but neither of them is surrounded by a picturesque view like Cape Bruny Lighthouse. You may want to book in advance for a tour up the stairs, which also includes a detailed history of the building. There’s a little museum to peruse in the nearby house and a few tracks around the grounds to wander through. As usual, use caution when hiking. On the opposite side of the road from Bruny Island Honey is the beginning of Cape Queen Elizabeth Walk. The first 20 minutes feature an unremarkable view of a 4WD track with trees lined on either side, but once you reach the beach things get interesting. The first point of call is The Arch, which is a photographic wonder and fun to climb. Continue north along the beach and rise into the trees to be greeted by expansive views of the Pacific Ocean. As you continue along clockwise, you’ll be gifted a big finale as you return to the lagoon. Yes, it looks just like the picture above.